Once you have finished the most difficult part which was shown in a previous post, you can proceed to the next step: add the waist darts and the ease values. But before getting into darts, it might be useful to check an important detail: the thighs size. As you might noticed, the basic pattern takes into account the hips size. But if you have large thighs, the theoretical width obtained from the calculations might be too small. Therefore you should measure around each thigh and compare it to the value of the pattern (in green in Figure 1). Once you have corrected your pattern, you can proceed to the following step. If you have a small waist but proeminent hips, you can create several darts for the front and the back, knowing that, the closer you are from the side, the lower the value of darts will be. On the contrary, if the difference between your waist and your hips is not very high (less than 15 cm), you can avoid the front darts. The value of a front dart can not exceed 2 cm. The front darts are created on the center line and then to the sides, half way between the center line and the side line (Figure 3). If you’re more curved on the back and have a flat tummy, you might need to increase the value of the back darts. The value of a back dart should not exceed 2.5 cm. If you want to absorb more than these 2.5 cm, you need to create more back darts and place them at one third and two thirds of the width from the side line (Figure 3). If your belly is not as fit as you wished to, it might be useful to lower the front waist line and increase the center front dart. The value of this dart is 1 to 1.5 cm and will be deffinitively set when you try on the test trousers (Figure 4). The back side dart was set at 1.5 cm during the pattern construction. It must have the same value and the same shape as the front side dart (in red). 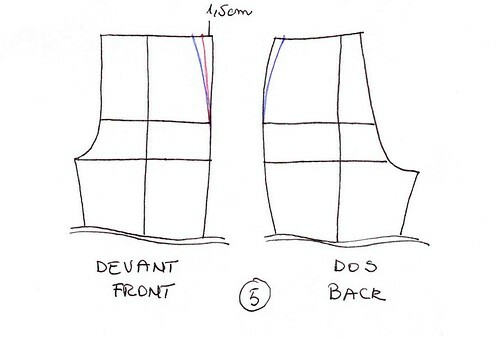 If you need to absorb more value on the sides, first change the back side line and then transfer the new line on the side front (in blue in figure 5). 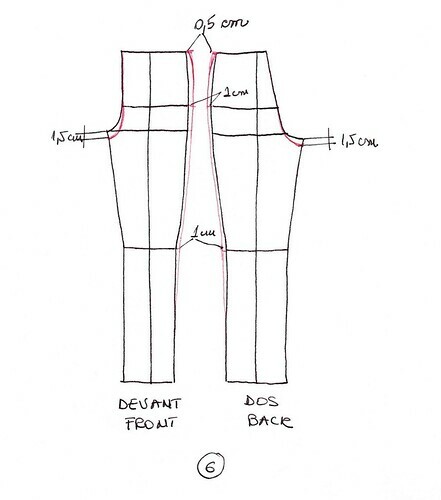 The pattern you just created is the basic shell and you must keep it safely for future trousers pattern alterations. 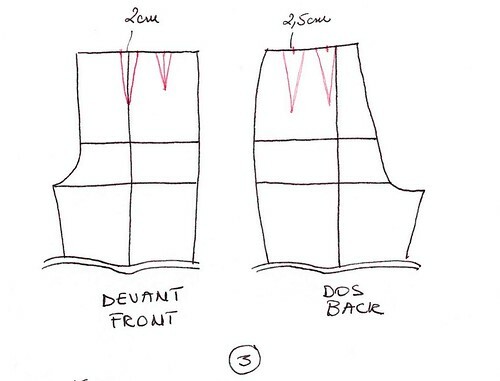 If you want to test this pattern (which is strongly recommended), you need to add the minimum values of ease and then cut the pattern in a cotton cloth to make final adjustments on your body, adjustments that I described here. You need to set the ease values depending on the model you choose and the fabric you use (stretch, light or heavy). You now have the necessary elements to create your tailored trousers. Do not hesitate to give me a feedback on this method which is inspired from the book of Teresa Gilewska, “The Fashion Pattern-Making, Volume 2”. From now on, draft beautiful pants. This entry was posted in Patterns and tagged made to measure, pattern, trousers. crotch length increased by 1/2 inch now baggy / extra fabric in thigh area. Is there a way to increase crotch length w/o increasing thigh circumference ? 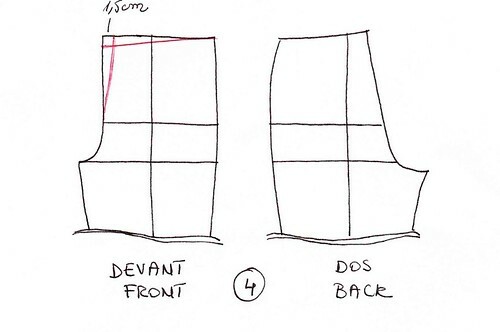 hi Ann, in my article I showed how to addapt the pattern if you have large thighs, but your problem seems different, so before answering, can I ask you why you add 1/2 inch to the crotch length? How is the length of the dart calculated? Hi! What about seam allowances? Seam allowances wouldn’t be included in these, but you just need to add the desired amount all around when you trace/cut out your fabric (or retrace a separate copy of your finished with the added seam allowance, so you won’t have to do it every time). 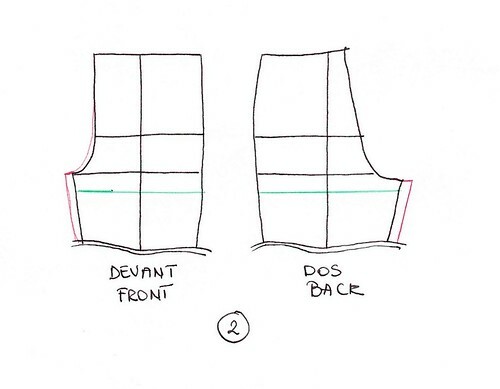 Commercial patterns like ‘Simplicity’ tend to use 5/8″ (1.5cm) seam allowance, but I usually just give it about 1/2″ or even 1/4″ sometimes, which is generally the width of the presser foot on your sewing machine. How do I measure back waist length ? Thanks. I love this article, it is very helpful. Thank you. 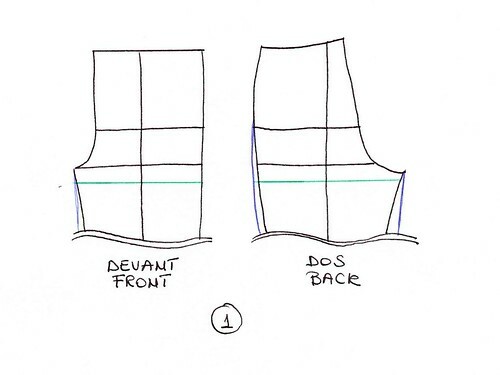 Please , can this method be used for drafting kids pant pattern as well. And can one use elastic band waist with this method ,if yes, How do one provide for that . My question is: what does the resulting clothing piece look like? Is there a picture example? I’m asking because I want to make high-waisted trousers, that really hug my waistline. This is important because I just spend a month or so on pants that were seemingly ‘high’ waisted but turned out to hug my hips instead :O haha, no big problem, but I just want to get it right this time. Thanks for the detailed and simplified description. If I am to add a zipper, please what adjustment would need on my crotch.